1974. The country is ravaged by famine. A conscientious man at Chittagong University noticed that the people were giving up everything for a little scrap of food. He tried to get to the root of the problem, only to find that the poor were the hardest hit. The local moneylenders refused to give them credit, while institutional credit was extremely limited. So he diced to carry out a survey to see how much people were giving up. The forty-two people on his list were striving to take out a loan of Tk. 856. He then decided to pay the money himself. Inspired to make arrangements to provide loanable funds in the future, Yunus approached the local branch of the Janata bank. Unwilling to extend credit to the poor, fearing that they would be unable to pay back, the bank refused. The intense argument that ensued with the manager, led Yunus to take out a loan himself and lend out the money. 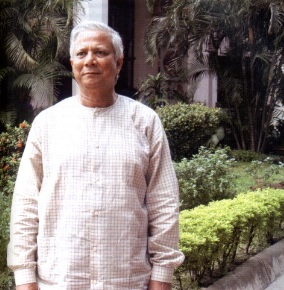 One thing led to another, and Grameen Bank was born. Today, it has crossed the five million member mark and boasts US$5 billion in cumulative loans disbursed. Owned by the borrowers, the bank functions on its own deposits. Neither the government, nor the international agencies have a hand at provifing the funds. 99% of the loans are returned. Grameen Bank’s program reaches out to the poor, extending to household and student loans for the underprivileged, as well as towards subjugated women and beggars to help them become more enterprising. 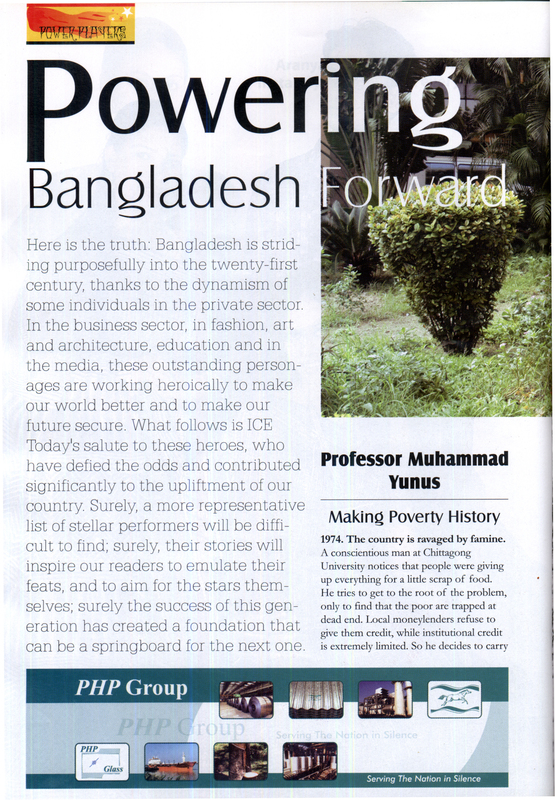 Grameen Bank has put Bangladesh on the map. Professor Yunus, nominated for the Nobel Prize this year, is hailed the world over as the brainchild of microcredit. World leaders look to him for inspiration; the needy salute him as their savior. ‘The biggest challenge,’ says Professor Yunus, ‘was to free the people from their mindset. Till date, getting rid of the notion that lending to the poor is inconvenient is hard.’ ‘The decision to refuse funding from outside was one of our turning points,’ says Professor Yunus, a decision he would have liked to have taken earlier. Professor Yunus believes that a person can get out of the poverty trap if he is determined to. Professor Yunus comments, ‘Take away the obstacles that surround the poverty stricken, so they can stand up on their own feet.’ He deems the financial institutions as being unfair to the poor, taking advantage of their handicap. He believes that opening the doors to banking, education, information technology and healthcare can help the poor work towards a better living. It’s owing to the creation of such obstacles that the poor have fallen into the poverty trap. ‘We want poverty in the museum, not in the society,’ says Prof. Yunus wisely. The rich and the poor have the same capabilities, only one has the opportunity to express it, while the other has been shrouded by hurdles. Scientist, author, professor, mentor – Md. 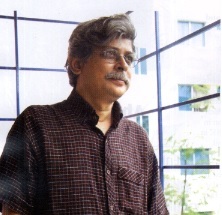 Zafar Iqbal is a man of many aliases. His astronomical talents in all fields have earned him celebrity status. There is no end to his list of awards, nor is there a finish line to the number of activities he races to uphold. His students hold him in the deepest regard; his fans place him on the highest pedestal. Zafar’s decision to return to Bangladesh has given him a new lease on life – it’s now more meaningful and entails much more fun. He found time for writing and he relishes the fact that little children love his work and they love him for the books he has written. “I am always scared that I will not be able to repay what I got from them,” admits Zafar. He believes that no one should miss out on reading books. “We never got to meet Tagore or Hemingway or Feynman, but if we read their books we can actually spend time with them. It’s so much fun!” says Zafar. When asked if there was one thing he could have done differently, Zafar ponders and replies that there is nothing that he would change except maybe his moustache. “I probably shouldn’t have grown my moustache. It turns gray too early!” replies Zafar, with characteristic humor.